1. Cook the spaghetti as per instructions on the pack. 2. Gently fry the mushrooms in olive oil. 3. 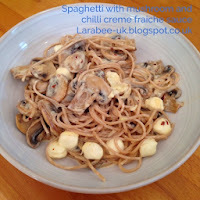 Drain spaghetti, adding 2 tbsp cooking water to the cooked mushrooms, add the creme fraiche, mozzarella pearls, chili flakes and creme fraiche, heat gently but do not allow to boil. 4. Stir through the spaghetti and season with Parmesan, salt and pepper.